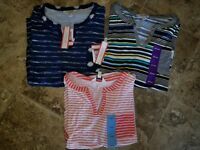 Ladies LIZ CLAIBORNE Striped Tee Shirt. Short Sleeves. Size 1X. Pit-to-Pit Measurement: 26 1/2" Sleeves Measurement: 14 1/4"